The Magellanic Clouds are our nearest example of dwarf galaxies in an early stage of a minor merger event. The distribution of their stars and gas indicate an active history of formation and interaction. Fast forward to today: high-precision time-domain optical (e.g., MACHO, OGLE) and near-infrared surveys (e.g., VMC) covering ever larger areas have now firmly established the Magellanic Clouds as laboratories for variable star astronomy, stellar evolution, stellar populations, and galaxy interactions, as well as anchors of the extragalactic distance scale. 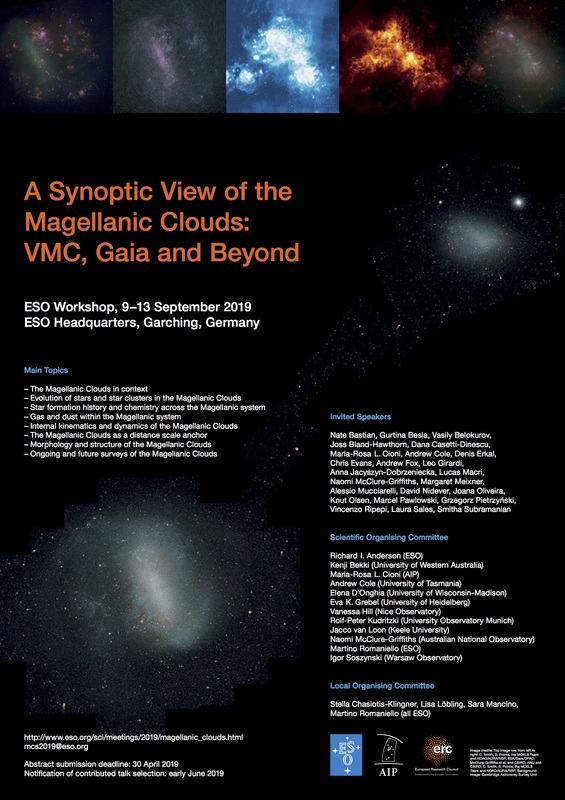 Moreover, we are learning increasingly about the Clouds themselves: Cepheids and RR Lyrae stars unravel their three-dimensional structure, and Gaia has recently provided an unprecedented view of the LMC's rotation. For the first time, the community is beginning to link age and metallicity distributions with the kinematics and structure of stellar populations, thereby deciphering the formation and evolution of the Magellanic Clouds in great detail. Please consult the webpage or e-mail for more information. Registration is now also open.